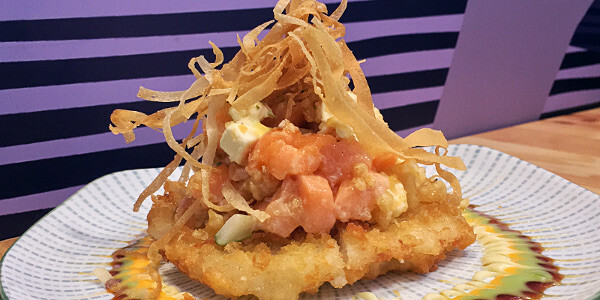 This Japanese restaurant in Salcedo Village, Makati, calls their creation the Sushi Pizza. 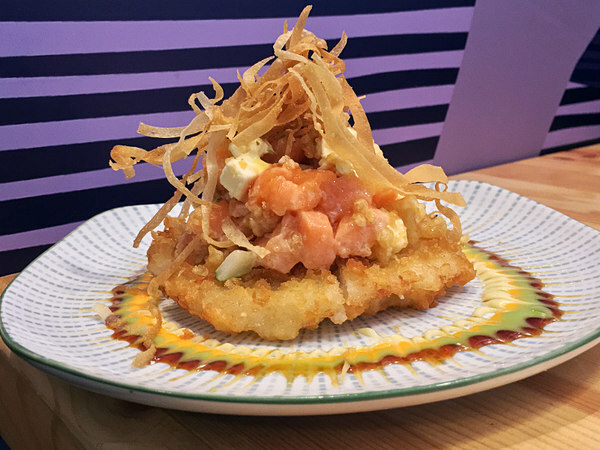 We think it's a funky Asian twist to a hash brown, topped with sushi fillings. Either way, it's a fun appetizer to kick-off your meal at Koku. 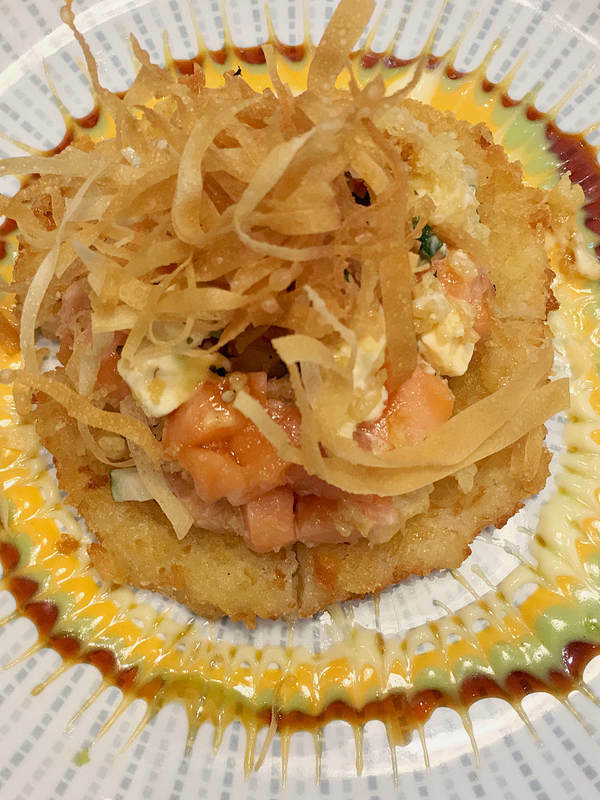 Don't expect a big thin crust pie to be served to you -- this Sushi Pizza is more like a mini pizza. The pizza crust here is a sushi rice patty that has been fried until it's golden outside, it looks like an oversized hash brown. The crunch is similar to a hash brown, too. It's then decked with toppings usually found as cold sushi fillings. 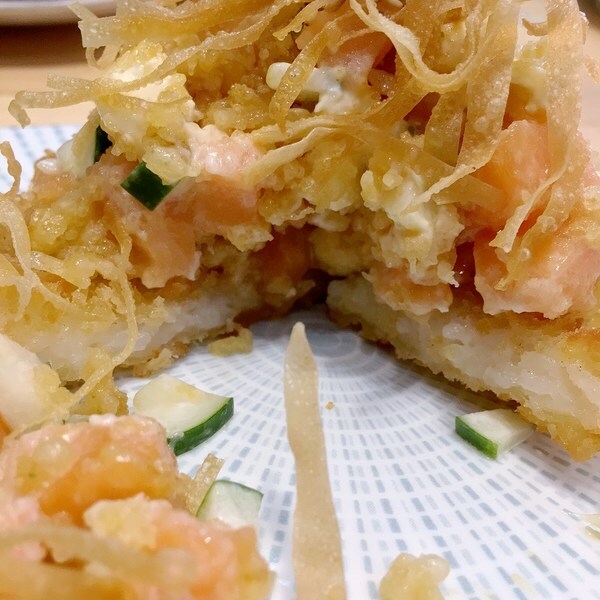 Their Salmon & Cream Cheese Sushi Pizza, for example, comes topped with tiny cubes of salmon, cream cheese, and cucumber bits. Crispy wonton strips crown this pizza. It's best eaten with your hands (it was quite a challenge to tackle it with a pair of chopsticks), and this is where the fun begins. The crispy rice patty is chewy on the inside, and the cool bits of toppings contrast the textures of the crust. The salmon and cream cheese combination is classic, and overall this four slices worth of fun appetizer tastes sweet and refreshing. If you want more kick, get the Spicy Tuna Sushi Pizza with chopped tuna in spicy sauce; for a completely meatless and vegetarian friendly option, try the California Pizza -- their modern twist to the classic California Maki roll with toppings of kani, mango, and cucumber. Visit Koku located at the ground floor of Two Central Building along Valero Street, Salcedo Village, Makati; open daily from 11am to 10pm. Call +632-625-5197, like on Facebook (/kokuph) and follow on Instagram (@kokuph).